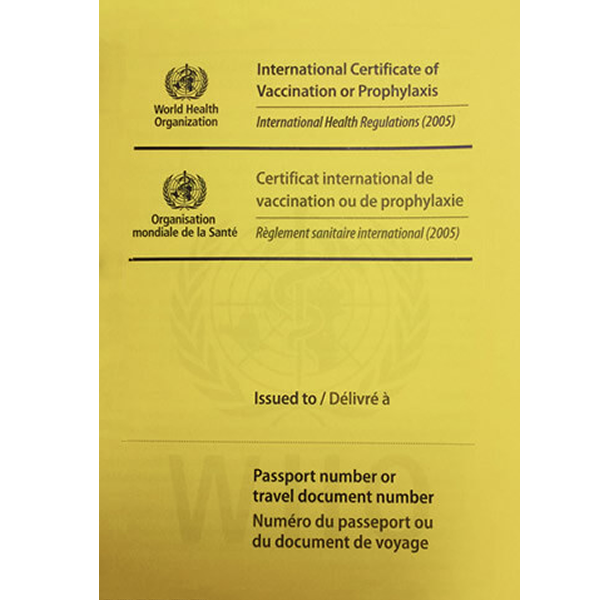 The International Vaccination Certificate or Card is a mandatory requirement for traveling to certain countries, especially Africa, Asia, Central and South America. It also serves as a control since the vaccines that have been applied are documented. It is usually available in different languages, usually the language of the country in which it is issued, French and English. From June 15, 2007, according to the IHR (International Health Regulations), this new certificate was put in circulation with new guidelines that in turn, are decreed by the WHO. In order to obtain the original certificates that countries require to let you in, you must contact the World Health Organization directly, comply with certain guidelines and carry out various procedures, therefore not everyone has these certificates. The International Vaccination Certificate or Record allows you to validate that you were given the yellow fever vaccine in addition to other vaccines necessary for your stay in other countries. It is given to you when these vaccines are given. Since all the primers have the same format, they are understood in any country, however, you must pay special attention to the watermark stamps that guarantee that your certificate is totally original. WHAT DATA MUST YOUR OFFICIAL CERTIFICATE HAVE? On the cover, the name of the bearer or traveller. Each traveler, child or adult, must have their own certificate. The World Health Organization (WHO) registration number. Signature of the owner of the certificate. Data of the vaccine received: lot, bar code, etc. Seal from the clinic where the vaccine was given.